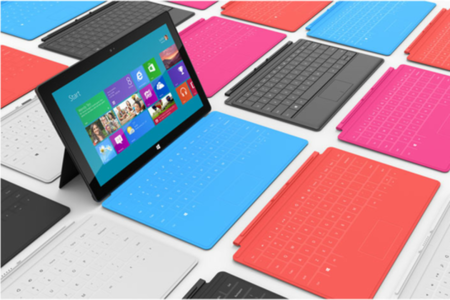 The much anticipated Microsoft Surface tablets are currently announced. Through this Microsoft is trying to integrate harware with software for getting full flexibility much like the Apple. 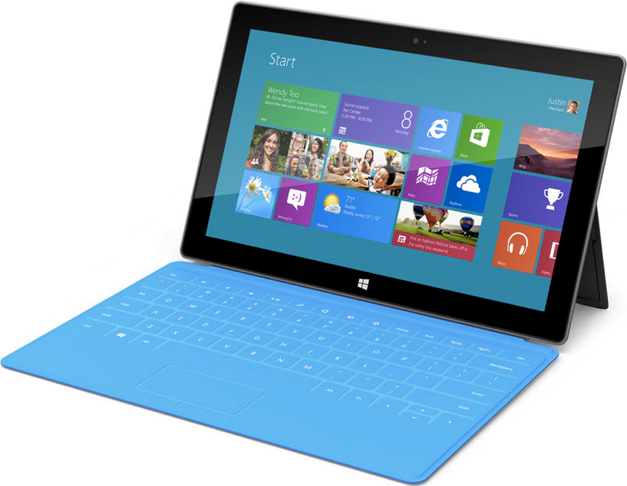 These tablet comes in two versions - Microsoft Surface for Windows 8 RT and Microsoft Surface for Windows 8 Pro. These tablets will run all the apps one can expect from Windows 8 and will have full access to the Windows Store. As Netflix for Windows 8 is coming, and the tablet will ship with a full version of touch-optimized Office. The Microsoft Surface for Windows 8 RT features 10.6-inch ClearType HD display, runs on NVidia's ARM processor and will have 32 GB and 64 GB models.Connectivity and Expansion options includes USB 2.0, Micro HD, microSD, WiFi. It weighs 676 grams(1.5lbs) and is 9.3 mm thick. The Microsoft Surface for Windows 8 Pro is heavier and thicker featuring 10.6-inch ClearType Full HD display, runs on Intel's Ivy Bridge (using the i5 core) processorand will have 64 GB and 128 GB versions. Connectivity and Expansion options includes USB 3.0, microSD, Mini DisplayPort Video. It weighs 903 grams(1.9lbs) and is 13.5 mm thick. The Windows 8 Pro version also includes 600 dpi pen input with Palm Lock making image still while writing on it. Common features of the tablets includes- the VaporMG case design(made of magnesium) makes it capable of scratch and wear resistant, and is sturdy and light. It has Corning's Gorilla Glass display which has a 16:9 screen ratio, built-in .7 mm thick kickstand which fits into the device, 3 mm magnetic cover which is a touch keyboard with a track pad and Metro user interface keys, ultra-wide viewing angles that adjusts to the environment. Comes with front and rear cameras, with the former angled 22 degrees makes everyone at a table be in the frame. The Microsoft Surface Windows 8 RT version will be priced comparably to other consumer tablets and will be available around the time when Windows 8 is made available which is in fall 2012. The Microsoft Surface Windows 8 Pro version will be priced like ultrabooks and will be available three months later after Windows 8 RT version launch. Both will be available via the Microsoft physical stores and online. Tags:Microsoft Surface tablet, Microsoft Surface tablet features, Microsoft Surface tablet specifications, Microsoft Surface tablet review, Microsoft Surface tablet details, Microsoft Surface tablet availability, Microsoft Surface tablet specs, Microsoft Surface tablet images, Microsoft Surface tablet pics, Microsoft Surface tablet pictures, Microsoft Surface tablet imgs, Microsoft Surface tablet price,Microsoft Surface tablet Network options, Microsoft Surface tablet Expansion options, Microsoft Surface tablet multimedia features, Microsoft Surface tablet Sensor options, Microsoft Surface Windows 8 RT tablet, Microsoft Surface Windows 8 Pro tablet, VaporMG case design, Microsoft Surface magnetic cover.